The Maiora 29 DP is the latest product of Fipa Yard, designed by Roberto del Re. 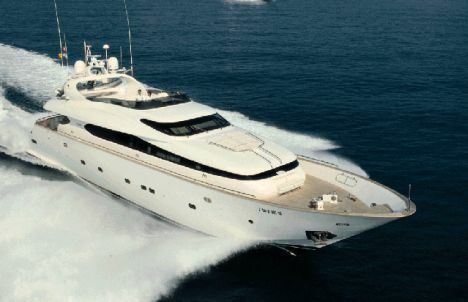 The design of this 96 footer is based on the previous 82-foot yacht, yet her stability and trim at sea are considerably better. The high levels of performance and aggressive beauty of the latest model produced by Fipa/del Re are the result of the combined study of the subtle relationship between hull, transmission, propelling unit and balance of weights on board. As a matter of fact, it is quite difficult for a boat of this size, with a full boat displacement of 83.6 tons, to appear so slender and so aerodynamic in shape, especially from an aerial view. Equally beautiful and innovative is the interior layout, showing great experience and creativity, care of owner needs and the will of expressing always and anyway new conceptions. The idea of making the salon essential yet very elegant is extraordinary. Every small item is especially chosen and introduced in order to increase the futuristic and sophisticated creativity of spaces and components that would otherwise be trite (e.g. the ergonomic seat, the bar, the wood paneling of the forward bulkhead, the hi-fi stereo and satellite color TV set, etc.). The 29 DP indeed represents, for the Fipa Yard, a further step of renewal toward a new range of double-deck yachts, starting with the 82 footer and continuing with the 96-foot yacht and over. Draft from lower tip of propellers: 5'7"
Price with standard equipment and test boat power: to be quoted depending on the interior decoration and on the requested fittings. Description and characteristics of the flying bridge: helm station with pilot settee for 3 persons and co-pilot settee for 2 persons; bar with barbecue, sink and ice-maker; ladder connecting the lower interior helm station; L-shaped dinette for 6/8 persons with table and settee; aft sunning area with cushions; tender storing area with hydro-electric davits; roll bar; ladder connecting lower cockpit. 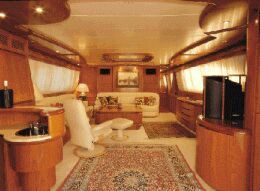 Layout and characteristics: salon with L-shaped dinette to port; bar is located aft; ergonomic seat for 1 person; chart table, hi-fi stereo and satellite color TV set to starboard. 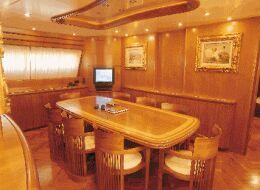 In the forward part of the salon there is the dining room with table and chairs, TV and cabinets for chinaware; forward of the dining room there are the crew galley and dinette. In the corridor separating the dining room from the galley there is the staircase to the upper helm station and the staircase to the lower staterooms. Forward of the galley is the ladder to the crew quarters. The master stateroom is amidships. 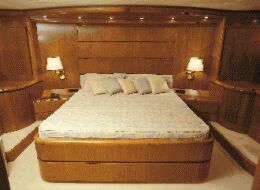 Forward there are the two twin-bed guest staterooms with a third recessed bed and the VIP stateroom. All staterooms have private bathroom. Crew quarters: 2 cabins and full bathrooms. Galley: full galley with cabinets, all household appliances including dish-washer, washing machine and Miele microwave oven, ceramic hobs, 79-gallon Frigit refrigerator and 37-gallon Lieber freezer. Standard fittings: in addition to the above-mentioned equipment, the following items are fitted as standard: all staterooms and living areas have an air conditioner (Condaria, 130000 BTU), Marinco water desalination plant (1,268 gallons/day), 30kW Onan generators, BCS 45hp bow-thruster. Interiors: very elegant and very refined. 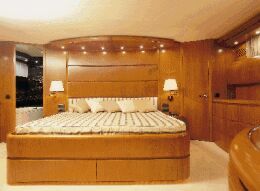 The salon has a special look and the staterooms are especially comfortable. All areas connecting the staterooms and living rooms such as corridors, staircases, etc. are extremely spacious. Electrical switchboard and plants: the electrical switchboard is fitted in the helm station on the upper deck and it includes all commands.